from some of our customers. On behalf of the Church Family at Davenport we just wanted to say a very big thank you to you and your team for all your hard work in replacing the windows. We are very pleased with the result - it will make a great difference both to the look of the building, and heating costs and our carbon footprint. We have really appreciated working with someone with Christian values who has done exactly what they said they would and more. So thank you once again from us all. I just want to say a big thank you because as usual you have gone an excellent job fitting the three doors at church. The brickwork also looks great, just what we wanted. It was lovely to see you again and I pray Gods richest blessing on you and your business. Many thanks for the first class job you have made of the new windows in our church lounge. Everyone at church is absolutely delighted with them as we always are with your work. Peter was as good as his word. The recommendation we received was fulfilled in every way. He brought a diligent, reliable and trustworthy team with him, who were pleasant and thoughtful. The work was completed as promised and lived up to our expectations. Peter's recommendations were based on experience and expedience and the final results fulfilled his promises to us. We were thrilled with the finished conservatory. We have no hesitation in recommending him to others requiring a detailed personal service. On behalf of Edgeley Community Church I want to say thank you for your generosity especially in this financial climate. The work you carried out on fitting the new doors and surround some time ago at the back of the church has transformed the building and made a difference to the efficiency of the heating system. 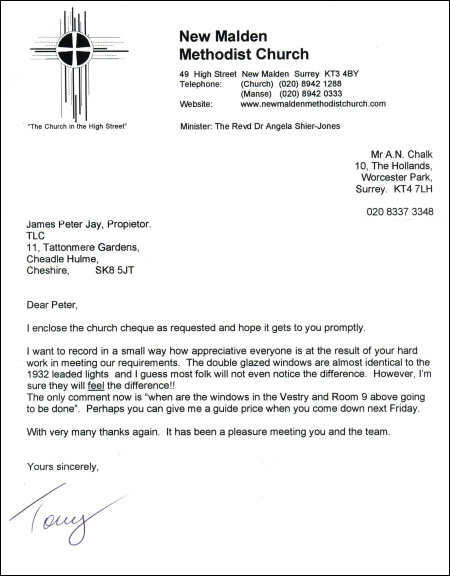 The work you have done recently on fitting the broken windows so promptly and professionally was excellent. It is a real joy to do business with you. I have highly recommended you to members of our congregation who have asked for your details. Just a quick note to say thank you very much for the conservatory. We are really pleased with it and use it every day. Everybody who has seen it have also made very favourable comments. May I convey my appreciation to you and John for doing such a good job. As you remember we were originally let down by another company but you kept on time and on budget. You kept us informed and gave us sound advice when we needed it, the end result was a conservatory that looks fantastic and is a great addition to our house. I would happily recommend you to friends and family and anybody needing a conservatory. Thank you once again and I hope your business remains good. We have been delighted with the new patio door assembly over Christmas given the particularly cold weather. It was all installed with the minimum of fuss and very quickly. We look forward to receiving the FENSA certificate and ten year independent insurance backed warranty in due course. 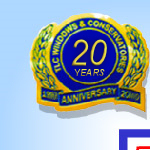 We have used the company T.L.C. and the services of Peter and his team for a number of years now. They have supplied and fitted windows, French doors and conservatories at many of our jobs. We are happy to use and recommend T.L.C. windows as they support us from start to finish. They provide a rapid turnaround with pricing. Their customer service is second to none and the installation is always to a high standard. What is most comforting to know is that on the rare occasion when an issue has arisen after installation T.L.C. have always been extremely prompt at resolving these. I am also more than happy to confirm this verbally if anyone would care to call 07813 777151. Just a small note to thank you for a job well done; the client is delighted with everything and the installation is a credit to you. I have used TLC for the past three years and I have always found Peter and his team to be very professional in all our dealings and his prices are always the most competitive. I always recommend him to all my customers. Shane McGleenan - SMG Construction Solutions Ltd. I use Peter of TLC Trade to survey and supply my windows, doors and conservatories for all my building projects and he has never let me down. He is friendly, reliable and competitive with his prices and very handy to know. We should like to express our sincere thanks for the sterling work done by yourself and your team at our home recently, we are delighted with the result and with the lack of disruption. With having all the windows done at once we expected chaos, so we were very pleasantly surprised. Your gang is cheerful and courteous, helpful and completely efficient, in fact a pleasure to have here. 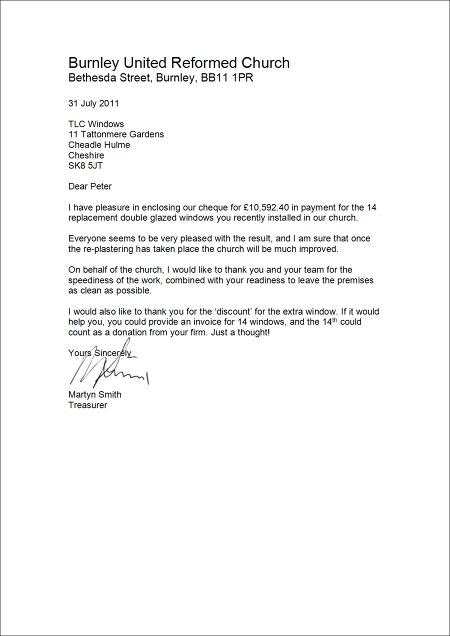 I am writing formally to thank you and nick for the excellent installation of my windows last week. I immediately began to feel the benefits of freedom from draughts, no heat loss, and less noise from outside. Thank you for installing the new window so promptly. It's a good start to the new year! ...May I also thank you for the job you did but additionally for the professional advice and help and courteous manner in which you conducted your business. I hope to contact you in the future regarding additional work to be done. ...Once again thank you for the prompt efficient way the process and installation of the windows and work was done. Also, thanks to the two workmen who did the job and the tidy, clean way they left the premises. We want to thank you for doing such a brilliant job on the front door. It has made an amazing difference to the hall. ...May god show you how much you have blessed us by enriching your life to overflowing. Many thanks for the lovely job you and your guys have made of my windows. I am very pleased - they look lovely. Many thanks for a lovely porch. It was done so quickly - no fuss, no mess. 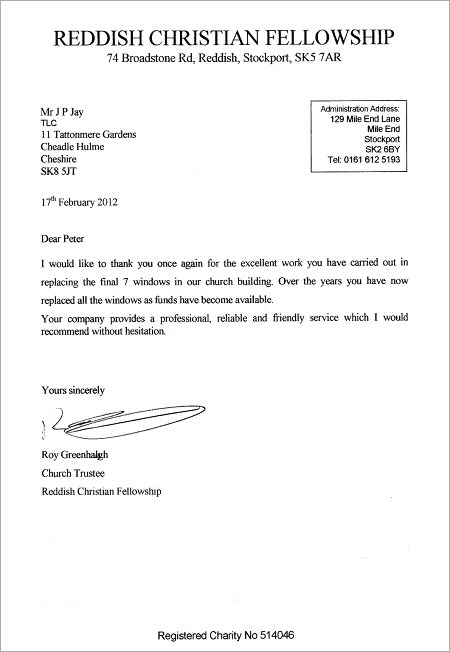 ...Peter, you have a first class organisation with a standard of workmanship that should receive top awards. Your team were first class and yourself. Your energy output and desire to give of your best is so rare these days.